In May 2012 the great Donna Summer sadly passed away. A few days later Astralasia closed the Bearded Theory Festival with an incredible uplifting version of ‘I Feel Love’ as a tribute to Donna. Inspired by the incredible crowd reaction Astralasia went into the studio to record the track. The session went so well they also recorded more tracks as a tribute to other artists also no longer with us that they had admired. One was ‘Faith Healer’ – the Sensational Alex Harvey Band track that was already a storming live favourite in Astralasia’s live sets and the other was ‘Riders On The Storm’ – a chilled version of the Jim Morrison/Doors classic. Astralasia released many of their most popular releases on the Magick Eye label and with Magick Eye about to launch a new series of singles and EP’s as part of it’s relaunch, it made sense for Astralasia to release this new EP on the label. The EP features the three tracks mentioned above – ‘Faith Healer’, ‘I Feel Love’ & ‘Riders On The Storm’ together with the live version of ‘I Feel Love’ recorded at Bearded Theory that started the whole process. 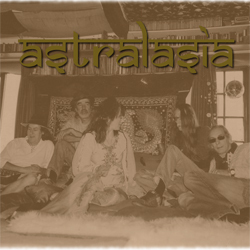 Astralasia continue to go from strength to strength and 2013 is looking good with live shows and festival appearances and a new album being recorded.